Note: These plans consist of a booklet of 11 pages of text and photos on 8.5" x 11" pages plus 5 - 18" x 24" drawings. The printed version is black and white. To save $25 and postage costs choose the download option below. 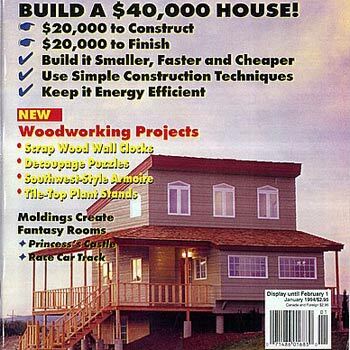 Originally published in Workbench magazine in 1994 as a do-it-yourself, owner built energy efficient home. The core module of the house is 20 x 24 feet providing a total 960 square feet in the two floors. This does not include the attached south facing sunroom, the roofed deck, the basement, or the north facing master bedroom which was added later. The house is designed for amateur construction so you can save contractors and laborers fees by doing all or part of the house yourself. The simple rectangular shape of the core module is easy to understand and build. The pitch or slope of the roof is gentle enough so it can be constructed without special scaffoldings or ropes, and also yields more usable interior space than a steeper pitch. The optional sunroom is supported by cement piers which are quickly installed using waxed cardboard tube forms available at building-supply centers. The piers were set and poured in place in less than half a day. Roof beams and floor joists were owner-built on-site in two days with 4 x 8 sheets of plywood and 2 x 4’s. Beams over 24 feet long can be lifted by two workers, and were filled with insulation, primed and painted before being placed in the house. 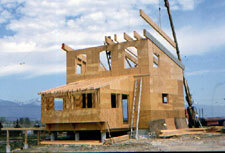 The Plywood House was designed around a central “core” module, into which all necessary utilities could be installed. Bedrooms, garages, sunrooms, studios and other spaces can be added to the core as time and funds allow, which keeps initial expenses to a minimum yet provided comfortable living space while finishing the house. Living in the core module also gives the builders time to consider how best to accomplish each addition. We built the prototype version of this house for ourselves and lived in it for two years. One of the best decisions we made was to include an earth-sheltered basement. Insulated basements provide very usable space at a stable year-around temperature. When it was –25 degrees outside during a long Montana winter, the basement stayed at 50 to 51 degrees, and when it was over 100 degrees outside the basement was still a very pleasant 51 degrees. The sunroom and solar gain of the south facing house plus energy efficient construction made it possible to heat the entire house with a small Jotul stove in the master bedroom, using fans to move warm air through the house. In 1994 it cost $20,000 to construct a watertight, 960 square foot shell with double pane windows, doors and basic electrical and plumbing installed. This figure does not include appliances or furniture. The average cost to finish the house; siding, hardwood and tile floors, painted walls, bath and kitchen fixtures ran an additional $20,000, but that figure can be higher or lower depending on personal choices. Adding a full basement provided 480 square feet of extra space, and cost $1070, which included extra hollow blocks and 8 yards of cement for the poured reinforced slab.